Remember the time we reviewed LeadFuze for our prospecting tool review series? 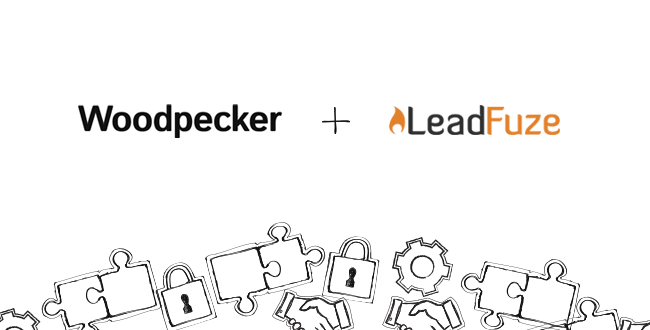 Now I can finally announce that Woodpecker has integrated with LeadFuze. And in this guest post, Justin McGill himself will tell you what you can do with the integration. Keep on reading to discover how you can benefit from using Woodpecker and LeadFuze according to Justin. If you haven’t, wouldn’t that be amazing? Well, it’s officially possible now to fully integrate LeadFuze with Woodpecker. This post will highlight and explain what exactly that means for you and your business. Plus, a resource of tests you can (and should) run on your emails to make them perform better over time. I know the Woodpecker crowd mostly knows this so I won’t spend much time here. Cold email outreach, done correctly, is not spam at all. Here are a few examples of spam. Blasting a million emails to millions of people with either a scam or overt pitch from an untrustworthy source. Blasting a million emails to a few people without regard to their desire to opt out and not even providing a way for them to opt out. Running a scam and using email to scam people. Do you do these things? Stop reading and think about your choices. Now, let’s get into sending powerful cold email outreach to the right people. Let’s define. Cold Email Outreach Is: Sending emails to the inbox of hyper-targeted contacts that contain an offer your prospects find interesting. Before you go forward, you have to look back. Specifically, to your current and past customers. The people who keep showing up and are always satisfied with your company. That’s who you want to replicate. It takes understanding a few things. Now, we can log into LeadFuze and find those exact leads! What’s the Best Market to Find Leads? In order to keep things clear, I’ll use an example. Example Company: Software development house looking to pitch media companies on comprehensive web and application development. Makes sense in an age of streaming that media companies would want top-notch applications and web capabilities to showcase their content. For finding these leads, you’ll want to really hone in on four different factors. Tech used by prospects that indicate money being spent on products/services like yours. Doing this manually would take hours of prospecting every week. Let’s take a look at how easy it is with LeadFuze. After logging into LeadFuze, you’d click the “Search for Leads” button in the top left. Doing this will take you directly to our “Market Based” option. You can choose to do an account-based search and I’ll cover why you’d want to do that at some point in just a second. First, we’ll start with the role of potential decision makers. As a software house, you’ll likely want to talk with someone in Ops or Tech. Here’s how that would look (gif below). Notice: the red terms like “assistant” at the bottom. This is the app filtering out titles that would not be decision makers. Now, we’ll input the industry. There are dozens to choose from, which is why I’m sticking with an example of “media” companies. See the gif for this step. Note: You can choose more than one industry in the same search, but you may want to save different searches for each industry. This will allow you to keep your outreach clean and test which markets work better. Give some thought into who’s going to take you seriously AND be able to afford you. In our case, you’ll want some good-sized businesses who have the budget to create a streaming platform with all the bells and whistles. That said, if you’re a solopreneur doing websites for small businesses, you probably don’t want to pitch Viacom. LeadFuze separates this into 3 broad groups of small, medium and large businesses. Then, results can be further limited in several number sets. For our example, I basically chose any business with 200+ employees. Now we’re getting into some of the most exciting criteria for really zooming in on your target market. Finding companies that are already spending money in your field is goldmine-level data. And LeadFuze has dozens and dozens of tech to narrow down your search for quality leads. For our example, you could use tech like Java or Databases to find sites already speaking your language. It may seem that doing this yields fewer leads, but the leads you get will be more willing and able to hear what you’re saying. Better leads mean higher conversions. Here’s a gif of me running through a bunch of the tech options. Finally, just hit “Search” and see the results. Once you have the decision makers email/phone number — you can find those influencing voices around them. Using our example, if you have the operations exec of a media company, you may want to be reaching out to project managers and department heads under said exec to make things move along faster. LeadFuze has a quick simple tool to search brands for multiple or even a single email address. Using the account based search is simple and can help you find multiple influencers for your decision makers. Once you have input your criteria, there are multiple things you can do. We suggest that you save the list and then manage your integrations. (For instance, you can hook up your CRM and Woodpecker.) Then, you can have a number of leads pulled fresh from this search and put in those tools each and every day — on autopilot. This is where the power of the integration between LeadFuze and Woodpecker comes into play. You pull 50 leads a day from LeadFuze (based on a search very similar to our example). Those leads go into your automated campaign specifically set up for that industry. So leads come in and emails go out for as long as you want just by setting up two tools one time. You have the leads, you have the right tools to reach them. So, what should you send instead? Given that Woodpecker puts out some amazing content, I don’t need to spend a lot of time here either — So I won’t. Consultations: Taking your knowledge and experience and giving usable advice for free. Giving away all or part of the tactics you use. Then, offering to get paid to implement them. Webinar: You can actually put a consultation and/or case studies into a video form and create a webinar. Sending leads an invite is a great way to start the conversation and lure them into an environment for a pitch. Here’s a great example of cold emailing tips from the Woodpecker blog and here’s one from us at LeadFuze. I’ve seen some dismal open rates and click-throughs over the years. But I’ve also noted the possible benchmarks just about anyone can achieve through testing and tweaking over time. Make a huge list of elements, sentences and even different offers to make and start them one at a time. Send at least a few hundred emails in between each tweak to see how it affects results. Here’s a list we put together of 50 Split Tests specifically for cold emails. Ready to use Woodpecker and LeadFuze to automatically and consistently reach out to the perfect leads? Let me know any questions and I’ll be hanging around the comments. Justin McGill is the Founder of LeadFuze, B2B lead generation software that allows you to find anyone’s contact information in your target market with unlimited access. Entire lead lists built for you. Great Article! I recommend to try eMail Prospector to build targeted prospects list for your business. eMail Prospector allows you to grab prospects from any sources on the internet. i.e. social networks, corporate websites, excel spreadsheets etc. Automated prospecting with woodpecker email clients, get 50 free contacts with eMail Prospector to start your email outreach.